On the fringe of Hobart’s CBD, clad in brown brick and cement slabs, stands Surrey House. Built in 1978 the exterior is still reminiscent of the time and style in which it was built. But forty years after its doors opened, hidden behind this boxy and retro façade, is the new Surrey House featuring three new state of the art office fit-outs for Pitt & Sherry, Aldanmark and Ray White, where aesthetics and sustainability collide. Unknowingly paying tribute to the building’s beginnings, Tasmanian hardwoods are featured beautifully throughout. The Pitt & Sherry reception area is a surprising contrast to the underwhelming exterior of the building. Warm and welcoming, it is lined floor to ceiling with a custom feature Tasmanian Oak wall that extends across the ceiling and continues throughout the center of the open floor plan space. 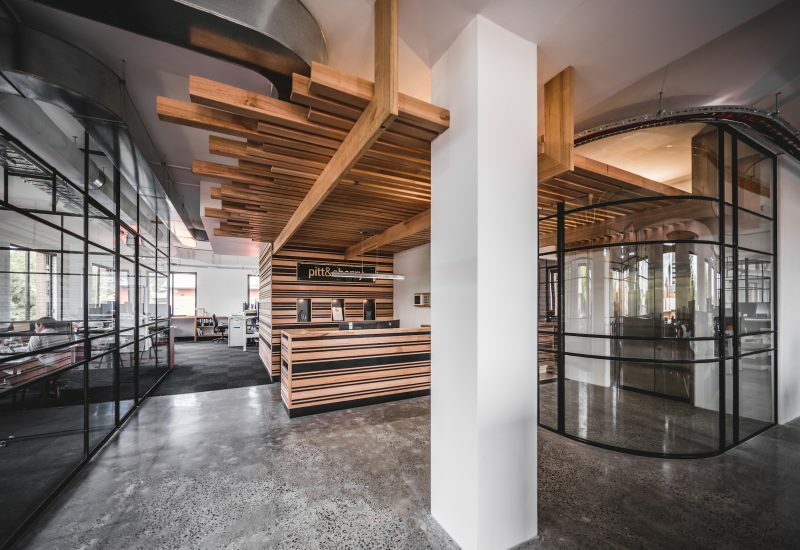 In addition to the striking wall and ceiling is bespoke Tasmanian Oak shelving that wraps around the 320 square meters of office creating a connectedness throughout the space. The timber chosen shows off the stunning natural feature of the Tasmanian Oak’s grain. In the heart of the open plan office space is the kitchen. Far from the typified office kitchen, it features a luxuriously large Tasmanian Oak bench top that serves as a place for communal respite with additional Tasmanian Oak tables nearby for extra seating. Complementing the warm tones of the Tasmanian Oak found throughout the rest of the office space including the employee lockers, bathrooms and joinery, are glass walls delicately lined with black steel to offer separation and privacy in the area. On the building’s lower floor, the Tasmanian Oak, steel and glass theme continues, but here a stunning timber feature wall serves as the office green space, lined carefully with potted plants and greenery to bring the Tasmanian wild in. Project Manager Braye Sutherland said the use of Tasmanian hardwood was an important feature that was an obvious material to include in the project. As it turns out, Surrey House was originally built as the headquarters for Forestry Tasmania, now known as Sustainable Timber Tasmania, so the use of Tasmanian timber was also a fitting choice to salute the history of the building. The basement level is yet to be completed, with the exception of new floor to ceiling windows lining two of the walls allowing abundant natural light to stream in, the space is still a blank canvas. Grown locally and sustainably, Tasmanian timber is processed to the highest standards, and backed by the technical support of Australia’s leading timber experts. Use it to transform your next project.